As part of our collaborative learning lab we will be posting videos from each of the sessions at our 2013 Art of Placemaking conference. The Art of Placemaking conference featured speakers discussing a wide range of topics from measuring and evaluating creative placemaking’s social impact to sponsorship research and social media for the arts. We had speakers from ArtPlace America; the National Endowment for the Arts; the Providence Department of Art, Culture + Tourism; the Kresge Foundation; and many other local and national organizations. You can see a full listing of speakers and their presentations on the Art of Placemaking conference website. 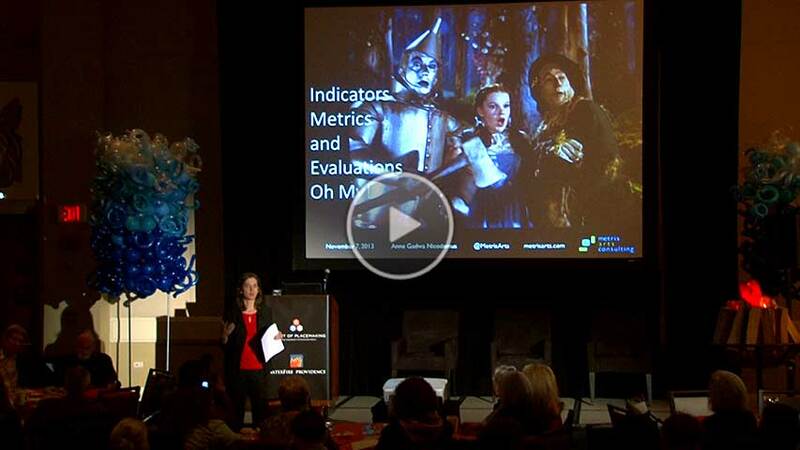 To kick things off we have posted the session video from Anne Gadwa Nicodemus’ presentation Indicators, Metrics, and Evaluations, Oh My! Anne Gadwa Nicodemus is the founder of Metris Arts Consulting where she is a researcher, writer, speaker, and advocate for creative placemaking. In 2010 she co-authored Creative Placemaking, the report for the Mayors’ Institute of City Design that defined the field. We will be posting the rest of the session videos here each Friday through May. You can also subscribe to our podcasts. Coming up next week we’ll have Changing the Narrative: Measuring Placemaking’s Effect on Neighborhood Narrative by Laura Zabel, executive director, Springboard for the Arts; and It’s All About People: Measuring the Social Impact of Creative Placemaking by Sarah Lee,vice president for arts & culture, Slover Linett Audience Research and Sharon Yazowksi, executive director, Levitt Pavilions.